Prepare your circles and study groups for Bible study in 2017 and 2018 with this flier promoting the new Horizons Bible study, The Cloud of Witnesses: The Community of Christ in Hebrews by Melissa Bane Sevier. In nine lessons, the author invites us to explore major themes found in Hebrews, relate these themes to other parts of our faith tradition, and tie them together with the overarching motif of community. 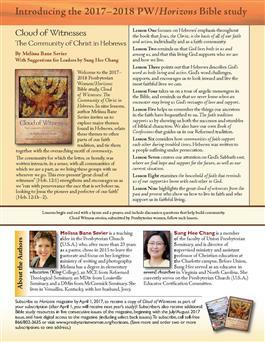 The flier includes ordering information for all Cloud of Witnesses editions (English, ecumenical, Korean, Spanish, large-print, audio AND video) plus related materials (promotional poster, pendant/charm, workshop for leaders and more). Order for your spring and summer events.